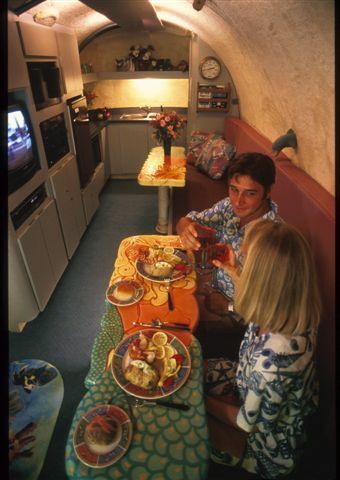 I am still not sure if this is true or an elaborate hoax left over from the 1980s (which appears to be when the photos on their website were last updated), but I present to you: Jules’ Undersea Lodge. It is apparently the world’s only underwater hotel, based in Key Largo, Florida. You enter the Lodge via a 21 feet scuba dive and the owners say that the lodge can accommodate up to six friends. Close friends, presumably, as it looks like a pretty small living area. Whether you’re after a unique sort of venue for your wedding (or perhaps not many people approve of the match, so you’re happy to have just the celebrant and some fishy guests?) or you are one of the handful of people who loved Kevin Costner’s Waterworld and want an underwater holiday, this could be the place for you. They offer wedding packages (with too many great photos to include here) and a range of overnight stays – choose from the Luxury, European or Ultimate Romantic getaway. Food is an important part of any holiday and don’t think that Jules has forgotten. On arrival, you are greeted with shrimp cocktail (of course! ), fresh fruit and snacks. The European Package “comes with a generous portion of grilled chicken breast”. Ooh la la. And despite being surrounded by a seafood smorgasbord, they begrudgingly cater for you wacky vegetarians, who “may substitute your shrimp cocktail with humus and crackers or cheese and crackers.” And it gets better – late night snacks can even include the underwater delivery of a pizza from a local shop. I was confused about how you got in and out of the Lodge, but Jules explains all: A five by seven foot “moon pool” entrance in the floor of the building makes entering the hotel much like surfacing through a small swimming pool. Divers find themselves in the wet room, the center of three compartments that make up the underwater living quarters. Aha. And in case you’re interested, each of the bedrooms and the common room is equipped with telephone, intercom, VCR/DVD. Seriously? Surely you can do without technology for one night and LOOK OUT YOUR GIANT BEDROOM WINDOW AT THE WONDERS OF THE OCEAN. 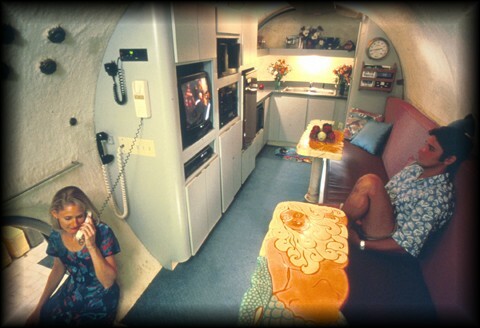 And one more thing, given the size of the cabin – WHO ARE YOU TALKING TO ON THE INTERCOM? Mysterious indeed, Jules. The home page of the website asks Have you slept underwater lately? In the unlikely event that your answer is ‘no’ (but you answer ‘yes’ to the question, Do you even actually want to sleep underwater?) then check out Jules’ Undersea Lodge. And you too could be having as much fun as the couple in this photo.